Link prospecting means researching websites for your future link building activities. It is the daily bread of each link builder, and without it, it would be hard to build any backlinks. So it basically means that you are trying to find sites that are suitable for collaboration and your primary goal is to get a link from them. Link prospecting is a whole thing and it can take you some time. It depends on the sources from where you are gathering information about potential websites. But you probably won&apos;t skip Google or other search engines as a source. In practice, it might look like this: Imagine that you&apos;re looking for websites that are relevant to a fashion shop. You might search for "fashion bloggers" or "fashion magazines" and then check out the first search results. If the website seems interesting to you, you might copy it and save it somewhere in your documents. This might take you some time. But Marketing Miner can do this for you. You just need to know what keywords you want to search for, and Miner Link Prospecting will take care of it. This Miner will crawl the first 60 search results for your specific keyword, and then will show you all the results together in one report. When you are doing research of websites that you want to approach. Your goal might be to get a link from this site or you might just want to contact them because of any other cooperation. If you don&apos;t want to browse search results for specific keyword manually. If you need to find out who is competing with you in search results. So in overall, you can use Miner Link prospecting in more ways. Not only within link building activities. It can replace any searching activities that you usually do manually through a search engine. Furthermore, it works exactly like a search engine. Even when you are searching through info operators like “site:”, “intitle:”, “inurl:” and so on. Get started by clicking on Create report button and specifying Keywords at the input. Then write or copy the dataset of the keywords for which you want to get domains that are showing in the search results for this keyword. We recommend having a pre-defined set of keywords that are relevant to you. You will need just a few keywords (about 5-10). For more keywords, you would have to go through thousands of sites, which would be even more time-consuming. In the Market prospecting section, click on Miner Link prospecting. Now you can choose a type of websites that you prefer. 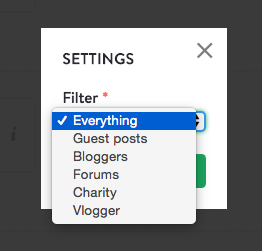 You can use for example Guest posts or Vlogger in case of some specific link building campaign. For now, just go with Everything. Landing page: The URL that appeared in the search results. Influence score: A metric that reflects how is a specific URL visible in search results for that keyword. The higher the ranking, the higher the score. Number of occurrences: How many times did the URL appear in the search results. For example: If the URL was present for all 5 keywords you typed in, the number 5 will be listed in this column. Domain: Domain of the given URL. Keyword: The keyword to which the URL was found. 1-10. position: How many times the URL occurred in the top ten search results. 11-30. position: How many times the URL ranked for 11-30. position. 31-60. position: How many times the URL ranked for 31-60. position. Exclude irrelevant domains and URLs. Focus on domains with a higher number of occurrences. Get data and explore relevant domains. Define priorities and reach out. You can also read this detailed guide about effective link prospecting, where you will find these 4 steps in more details.